I first hiked the 30.1 mile Art Loeb Trail in the fall of 2016. A drought made the hike more challenging than it probably should have been. I did it SOBO over 3 days. My first afternoon featured 4 miles straight up from Daniel Boone Campground to Deep Gap, where I camped for the night. The next two days were supposed to feature 14 and 12 miles, respectively, but a lack of water forced me to hike 18 miles to the Butter Gap Shelter on my second day. I was in okay shape, but I didn’t know my body as well then as I do now. I tore something in my left knee and it made the final 8 miles out excruciating on the third day. I’m in much better shape now and have taken steps to protect my knees from pain and re-injury. Over the past few months, I’ve taken on longer and longer backpacking trips in preparation for my thru-hike of the 211 mile John Muir Trail in September. I plan to average 17 mile days in the High Sierra. Since I can’t really prep my body for the high altitude, all I can control is my readiness for the terrain. It’s not uncommon for me to do 20+ mile days in the backcountry. It’s really not the distance that tests my body; it’s the elevation. A recent hike up to Clingman’s Dome in the Smokies made me realize that I can grind out tough ascents with surprising ease. I wanted to test myself with lots of elevation and a distance that will be much longer than anything I will attempt out west. Frankly speaking, I wanted to create a point of context that would make everything there seem simpler by comparison. So I decided I would day-hike the entire Art Loeb Trail. As you know, tech can malfunction, break, or run out of power. 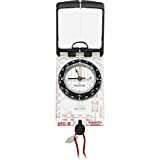 It’s prudent to take a contour map and a declination-correcting compass on your backpacking trips as well. This is the map and compass I used. I’ve pieced together enough loop hikes in the area that I’ve effectively section-hiked the whole trail several times in both directions. I can say with absolute certainty that it is easier to thru-hike SOBO. With that in mind, I parked my car at the Davidson River Campground after work on Friday and caught a ride to Asheville to spend the night. I wanted to hit the trail early to beat the summer heat. I was dropped off at the Daniel Boone Campground just as the sun was rising at 6:15 am. I crushed the first half of the trail, which is the best part of the trail. I made it to Black Balsam Knob by 11:00 am. That’s around 14 miles in under 5 hours. The main reason I go SOBO is that the trail between the Art Loeb/Mountains To Sea intersection (near the Silvermine Bald Overlook) and the Butter Gap Shelter is absolutely brutal NOBO. This section is much more manageable going SOBO, especially the climb up Pilot Mountain. It’s also the most boring part of the whole trail regardless of your direction. You’re in the green tunnel the whole way, there are lots of forestry road crossings, lots of side trails, and very few blazes to tell you where to go. The section from Butter Gap to Davidson River is probably a little easier going NOBO, but it’s not worth doing the next section in that direction as well. You just grind it out SOBO and try not to get deflated by the false summits on the way to the final descent to the river. I rolled my left ankle pretty bad while on autopilot, but I forced myself to walk it off until the pain mostly subsided. I made it to my car at 7:20 pm—just a little over 13 hours after I started. This wasn’t easy, but it wasn’t really that difficult either. More truthfully, it wasn’t as difficult as I had built it up to be in my head. I slowed down noticeably on the steeper ascents after mile 18 or so. I was very disciplined about eating and drinking at intervals throughout the day, but the sun and humidity started taking their toll by mid-afternoon. Around mile 25 near Cat Gap, I was having to stop to rest more than I usually do. That said, I was still flying on the relatively flat and downhill sections. I’m talking 4 mph at least. I felt really strong. As usual, I strayed off trail 3 different times and probably walked an extra 2 miles or so. Fortunately, most of it was on relatively flat terrain. There’s nothing more defeating than walking downhill only to find that you’re off course and have to climb back to where you were. Talk about self-loathing. Either way, this added at least half an hour to my thru-hike time. Check out this Fitbit data. The mileage is high because the device doesn’t know how to estimate stride length on steep climbs, but everything else seems about right. This is the first time I’ve busted over 60,000 steps and 600 floors. And I went way over. Honestly, I felt like I could have made it several more miles as long as the trail was relatively flat. My legs felt good aside from my left ankle and standard, minor knee aches. This hike provided me with some much-needed validation. I’m only 8 months removed from a time when this same feat took me 3 days and wrecked my body. Now I crushed it in 13 hours and spent the next day walking around Asheville feeling just a little sore in my calves and thighs. I listened to the audiobook, The Fold, by Peter Cline. It exists in the same universe as his other book, 14, but it can stand alone. It was the perfect sort of story (casual, humorous, sci-fi) to get me through the first 10½ hours of my hike. That time really flew by. I listened to music the rest of the way. I almost always have earphones in. Discover more hikes involving the Art Loeb Trail.